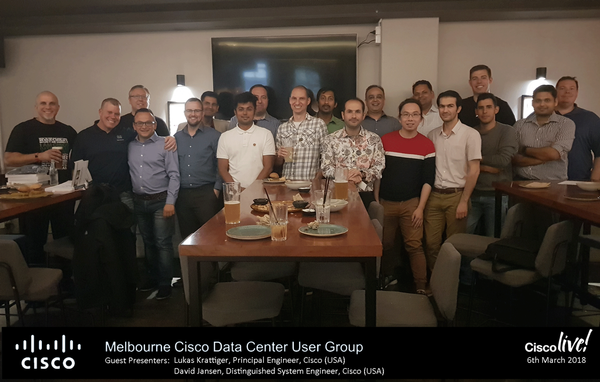 Last night we hosted the first Cisco Data Center User Group in Melbourne. It was a successful night with a great turn out and excellent interaction and networking between everyone that attended. Everyone was enthusiastic and willing to take part and really mate it a fantastic night. 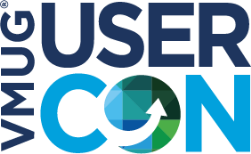 The user group was formed with the intention to create a space where IT professionals can come together in a relaxed environment to network, have a drink and learn about data center technology. We wanted to have an interactive and social atmosphere and thanks to everyone that attended and took part because that’s exactly what was achieved. One of the things that I liked most about the meetup was the attendance of people from other community groups. Craig Waters (@cswaters1) from the VMware VMUG community, Brett Johnson (@brettjohnson008) from the vBrownBag community and one of the presenters, Will Robinson, from the NetAppATeam. The support from other communities is great and we really appreciate it. The night itself began with an introduction from Derek Hennessy (@derekhennessy) and Chris Partsenidis (@cpartsenidis) on how the user group idea was formed. 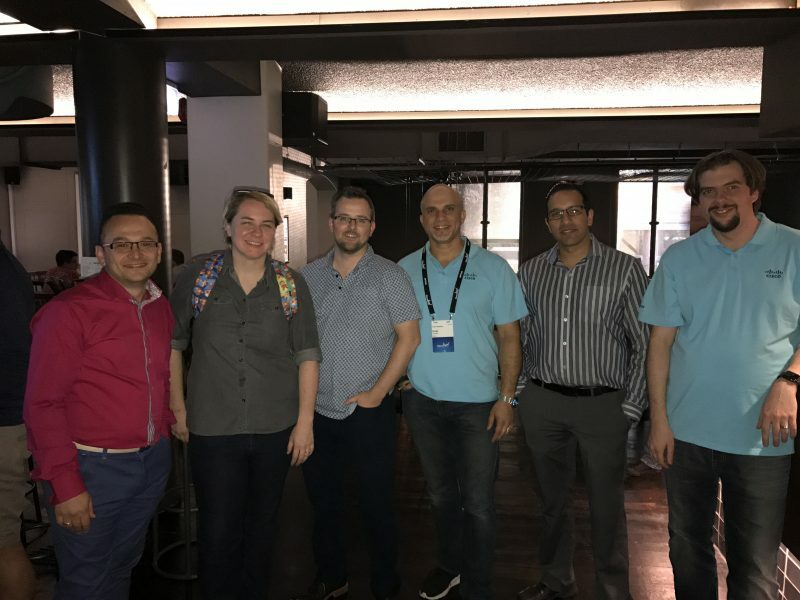 A shout out went to Lauren Friedman (@lauren) from Cisco for her help and support for getting the user group off the ground. We swiftly moved onto the first speaker of the night, Chris Gascoigne (@chrisgascoigne). Chris is a Technical Architect for Cisco ANZ with the Data Center team and has a focus on ACI, Nexus 9000, Automation/Orchestration and DevOps. Chris ran through a few slides on how network engineers can leverage tools such as Puppet, Ansible and Chef to implement the DevOps framework. He then ran through a demo of how to manage a Nexus 9000 switch from a bash shell and deploy Puppet configurations to a switch. Chris also emphasised the need to provide version control, code review and deployment into production. There were a number of questions from the audience as everyone tried to imagine using such tools within their own infrastructure environments. Unfortunately I don’t have a copy of Chris’ slidedeck to make available. A special mention goes out to Chris Partsenidis for performing the important task of being a microphone stand through Chris Gascoigne’s demo. I’ve uploaded the slidedecks from the night and in the future we hope to capture the presentations on video and make them available as an archive following the events themselves. All in all it was a great night and we believe we have now started to develop a new community. If you’re interested in learning about technology, having a drink and some grub, and meeting other IT professionals and networking then we’re really looking forward to seeing you at the next meeting on Tuesday July 5th. 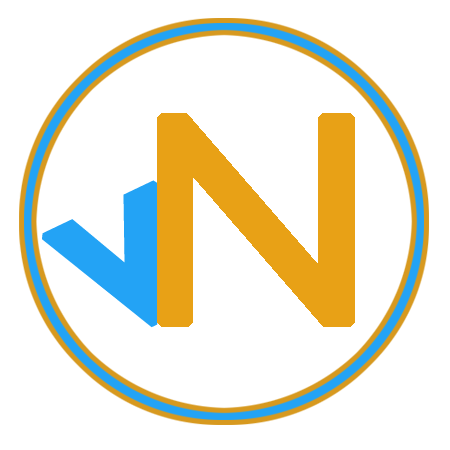 vNotions Logo LargeThose that frequent the site regularly will have noticed quite a few changes recently. I’ve migrated the blog from wordpress.com to a hosted wordpress site and the name has also changed from virtualnotions to vNotions. I wanted to get more control of the site and be able to develop it over time into something else as it continues to grow and develop. WordPress.com is excellent as a free resource but I wanted to be able to customise more. I really wasn’t sure what the best hosting solution would be as there are a number of options. There’s managed, managed hosted, virtual private server (VPS) and also the option of running wordpress in AWS. I turned to twitter to see if anyone had any recommendations for hosting wordpress. The first reply came from Mike Andrews (@trekintech) and I have to thank him for the recommendation. I had a look at a number of different providers and settled on DigitalOcean which was put forward by Mike. DigitalOcean have a strong community forum and supporting documentation so it was very easy to get everything set up. Each VPS in DigitalOcean is called a droplet and it’s very quick to deploy a new server instance. I stumbled across ServerPilot.io which allows quick deployment of apps on DigitalOcean VPS instances. ServerPilot takes a lot of hassle with setting up new apps and given that it’s also got a free option it’s very appealing. It also deployed WordPress using the Nginx engine so it’s considerably faster than just the LAMP stack with Apache. For quick reference check out this guide for installing wordpress on ubuntu and also this one one installing wordpress on DigitalOcean. There’s also a good guide on setting up wordpress on DigitalOcean over at MyBloggingThing. It was a straightforward process to set up a new instance of wordpress and migrate the content from the old wordpress.com site to the new vNotions.com site. Once the site was migrated and fully operational I enabled CDN using CloudFlare to improve speed accessing the site from disperse graphical locations. All in all, it was a relatively painless process. Right now I’m tidying up the posts on the site to clear out any old posts that are no longer relevant. I’d like to thank Mike Andrews for his feedback that set the ball rolling. For anyone thinking of checking out DigitalOcean I’d definitely recommend jumping right in. The support team at DigitalOcean were also top class and replied very quickly to an issue I had (self-inflicted I might add). vNotions has vMotioned from VirtualNotions. 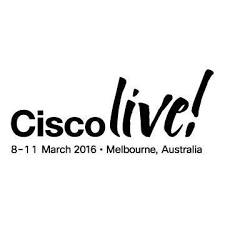 I gave a recap of Cisco Live Melbourne in another post and had intended on providing a detailed look at each of the sessions I attended as part of that post but it became a bit long-winded so I’ve broken it out into separate posts. I’ve broken the sessions down by each day. As someone that is working towards CCNA and CCNP in Cisco Data Center this extra technical seminar really was invaluable and opened my eyes up to a lot of areas that were unknown to me. This breakout session was an 8-hour, full-on overview of Cisco UCS, the components that comprise the solution and how it all works together. It wasn’t a deep-dive session however so if you’ve a really good working knowledge of UCS and know what’s under the covers quite well then this session wouldn’t really be for you. In saying that however I think there’s always opportunities to learn something new. The session was broken down into 6 parts. Two other notes from this section of the technical session were that the FI6300s requires UCS Manager 3.1(1) and the M-Series is not support on the FI6300’s yet. 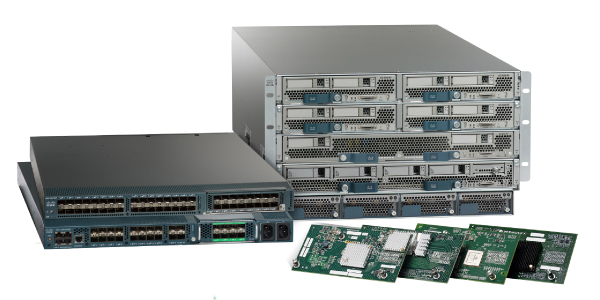 There was also an overview of the UCS Mini upgrades, the Cloud Scale and Composable Infrastructure (Cisco C3260) and the M-Series. I’ve not had any experience or knowledge of the M-Series modular systems before and I need to do far more reading to understand this much better. The second part of the session covered MAC pinning and the differences between the IOMs and Mezz cards. (For those that don’t know the IOMs are pass-through and the Mezz are PCIe cards). Once aspect they covered which I hadn’t heard about before was around UDLD (Uni-Directional Link Detection) which monitors the physical connectivity of cables. UDLD is point-to-point and uses echoing from FIs out to neighbouring switches to check availability. It’s complementary to Spanning Tree and is also faster at link detection. 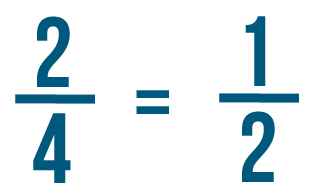 UDLD can be set in two modes, default and aggressive. In Default mode UDLD will notify and let spanning tree manage pulling the link down and in Aggressive mode UDLD will bring down link. The Storage Best Practices looked at the two modes that FIs can be configured to and also the capabilities of both settings. If you’re familiar with UCS then there’s a fair change you’ll know this already. The focus was on FC protocol access via the FIs and how the switching mode changes how the FIs handle traffic. The session also touched on the storage heavy C3260 can be connect to FIs as an appliance port. 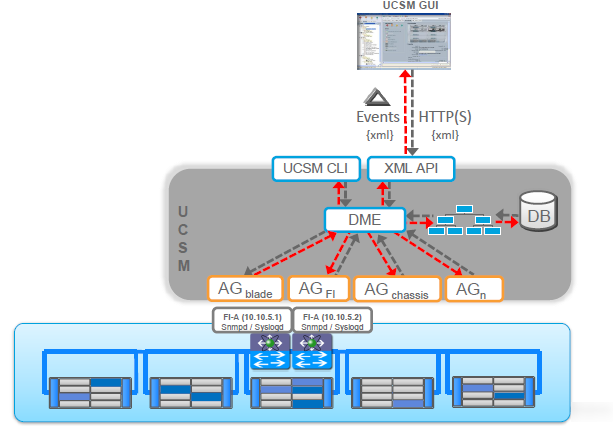 It’s also possible via UCSM to create LUN policies for external/local storage access. This can be used to carve up the storage pool of the C3260 into usable storage. Once thing I didn’t know what that a LUN needs to have an ID of 0 or 1 in order for boot from SAN to work. It just won’t work otherwise. Top tip right there. 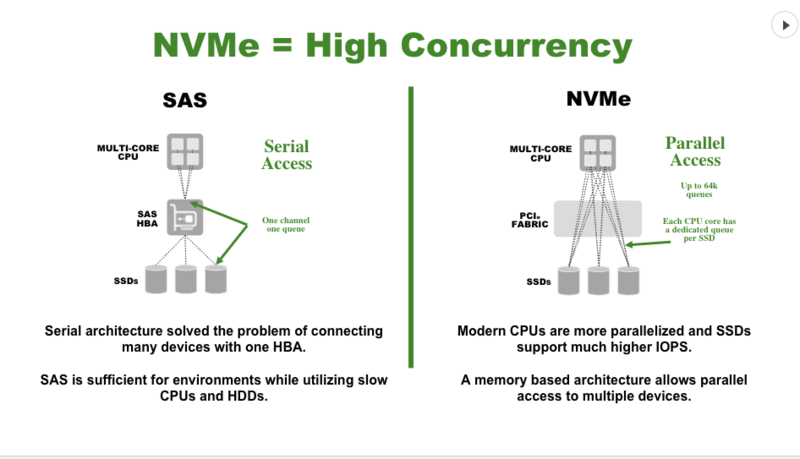 During the storage section there was some talk about Cisco’s new HyperFlex platform but most of the details were being withheld until the breakout session on Hyper-Converged Infrastructure later in the week. Fabric evacuation can be used to test fabric fail-over before firmware upgrade to ensure bonding of NICs works correctly and ESXi hosts fail-over correctly to second vNIC. There’s also a new tab for health also beside the FSM tab in UCSM. The last two sections of the session I have to admit were not really for me. I don’t know whether it was just because it was late in the day, my mind was elsewhere or that I was just generally tired but I couldn’t focus. The sections on Security within UCSM and UCS Performance Manager may well have been interesting on another day but they just didn’t do anything for me. 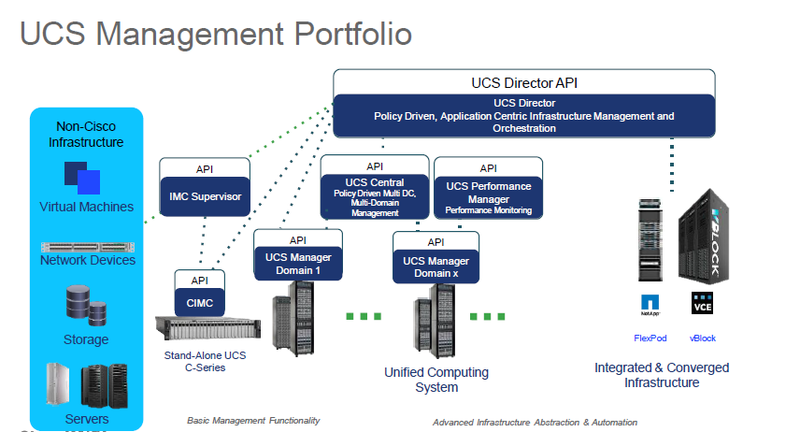 The information was somewhat basic and I really felt that UCS Performance Manager was really more of a technical sales pitch. I feel the session would have been better served with looking at more high-level over-arching tools for management such as UCS Director rather than a monitoring tool which the vast majority of people are not going to use anyway. Overall though this entire technical session was a great learning experience. The presenters were very approachable and I took the opportunity to quiz Chris Dunk in particular about the HyperFlex solution. While I may not attend another UCS technical session again in the future I would definitely consider stumping up the extra cash needed for other technical session which may be more relevant to me then. There’s a lot of options available. After the sessions were completed I headed down to the World of Solutions opening and wandered around for a bit. As I entered I was offered an array of free drink. Under other circumstances I would have jumped at the chance but I’m currently on a 1-year alcohol sabbatical so I instead floated around the food stand that had the fresh oysters. The World of Solutions was pumping. I didn’t really get into any deep conversations but I did take note of which vendors were present and who I wanted to interrogate more later in the week. I left well before the end of the reception so I could get home early. The next day was planned to be a big day anyway. One of my goals for the day was to attend a number of the community sessions. I found the vBrownBag sessions conducted by Alastair Cooke (@demitassenz) to be the most informative and entertaining sessions of the day, along with those of Chris Wahl. The award for the funniest session of the day went to Simon Sharwood (@ssharwood) from the Register as part of the vBrownBag session. It wasn’t just entertaining but a great insight into how content is derived for the site. I missed one of the sessions I had intended on getting to but here’s a break down of the sessions I did attend.